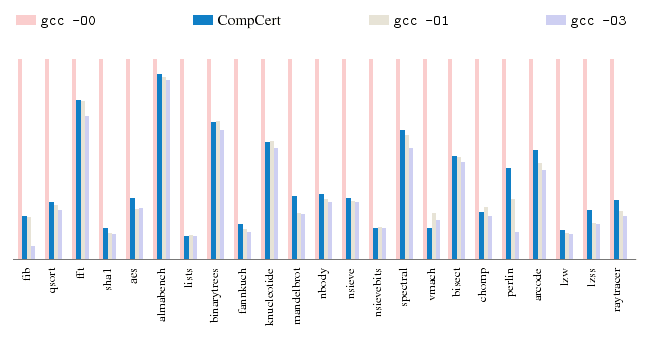 CompCert is a formally verified optimizing C compiler. Its intended use is compiling safety-critical and mission-critical software written in C and meeting high levels of assurance. It ac­cepts most of the ISO C 99 language, with some exceptions and a few extensions. It produces machine code for ARM, PowerPC, x86, and RISC-V architectures. CompCert is the only production compiler that is formally verified, using machine-assisted math­ematical proofs, to be exempt from miscompilation issues. The code it pro­duces is proved to behave exactly as specified by the semantics of the source C program. This level of confidence in the correctness of the compilation process is unprecedented and con­tributes to meeting the highest levels of software assurance. The Institute of Flight System Dynamics at the Technical University of Munich uses CompCert in the development of flight control and navigation algorithms. In November 2017 CompCert was successfully qualified by MTU Friedrichshafen according to IEC 60880, category A and IEC 61508-3:2010, SCL 3 for a certification project in the nuclear energy domain. The use of CompCert reduced development time and costs. Airbus France is deploying CompCert at the Toulouse plant for a number of currently undisclosed projects. Using CompCert is a natural complement to applying formal verification tech­niques (static analysis, program proof, model checking) at the source-code level. The correct­ness proof of CompCert guarantees that all safety pro­perties veri­fied on the source code automatically hold for the ge­nerated code as well. When using a conventional compiler to compile safety-critical applications, you typically have to disable compiler optimizations and run into resource problems as a result. With CompCert, you can significantly improve your applications’ performance, as you no longer have to switch off optimizations for safety reasons. On typical embedded processors, code generated by CompCert typi­cally runs twice as fast as code generated by GCC without optimizations, and only 20% slower than GCC code at optimization level 3. CompCert produces machine code for ARM, PowerPC (32-bit and 32/64-bit hybrid), IA32 (x86 32-bit), AMD64 (x86 64-bit), and RISC-V (32- and 64-bit). An optional tool called Valex is available for the postpass validation of the assembling and linking steps. It compares the instructions in the abstract assembly code produced by CompCert to the instructions in the linked binary executable, checks whether symbols are used consistently, whether variable size and initialization data match up, and whether variables are placed in the proper sections in the executable. © AbsInt. CompCert est developé et distribué par AbsInt sous licence d’INRIA.